Research | Boğaziçi University Electrical & Electronics Engineering Dept. BUEE Faculty performs research in 9 major research areas of the Electrical and Electronics Engineering discipline. There are joint research efforts with companion departments in BU such as Industrial Engineering and Computer Engineering, as well with other universities such as Karlsruhe Institute of Technology University, Télécom ParisTech, Université de Lyon, Polytechnic University, Hiroshima University etc. The research efforts are funded by various sources such as state programs, TÜBİTAK, international programs such as COST, Framework Programs, and by the industry. Biomedical Engineering: Biomedical Engineering deals with the application of electronic engineering and information technologies to the medical sciences. Control Theory: Control Theory is primarily concerned with theoretical modeling, estimation and control of physical systems and operational processes. Electromagnetic Waves, Microwave Techniques and Optics: This research group focuses on biological effects of electromagnetic radiation, remote sensing, and RF-MEMS. Microelectronics: Microelectronics Design and Applications involves MEMS device and integrated circuit fabrication, circuit and system design and simulation. 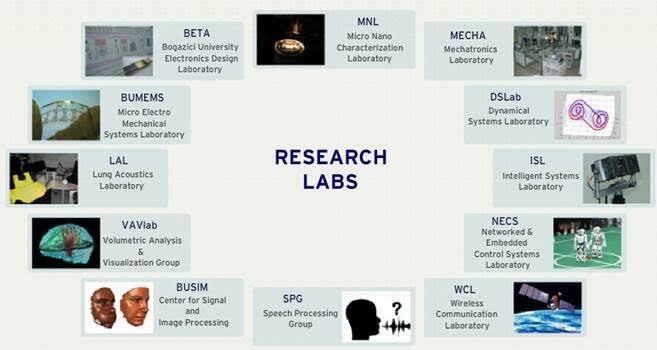 Signal and Image Processing: This group addresses problems of the representation, analysis and processing of signals for various applications. Telecommunications: Telecommunications group has expertise in wireless channel characterization, modulation systems and error correcting codes.